A Golden plate number adds that special “touch” to your car that tells the world that you mean business! In many cases your Golden plate number will probably outshine your automobile due to the exclusiveness of the number that you have. Some people ask us how to tell the difference between an exclusive or VIP plate number and a golden number, we usually request that they themselves study the different sets of our plates to find out on their own. The reason why we ask our clients to “find out on their own”, is to enlighten themselves in the appreciation of golden numbers and plate numbers in general. It’s very satisfying to talk with clients who can appreciate the value and clarity of owning a golden car plate number, as they will understand the full value of their plate acquisition. Where the Greek letter phi (φ) represents the golden ratio. While the Golden ratio is found throughout the universe, we base our golden number plates on the purity of the number which resembles the karat. When you look at a golden plate number you will quickly realize that all golden plate numbers share one common feature! If you take a few minutes to read through our list of golden number you will see that they all consist of only one number, which in some cases is repeated. This one type of number represents “purity”. 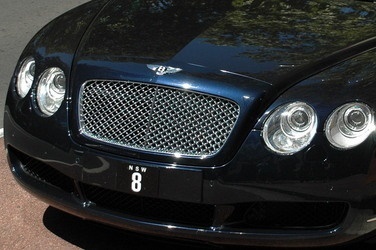 The most sought after number plates are the ones are both single digit plates and 4 digit plates. The number or digit selection is up to you to decide as we believe that everyone has their own lucky number which will help to bring them good luck and good fortune.